All babies NEED beautiful burp cloths and we found them in adorable prints and patterns by someone who really understands this necessity at www.BeeMyLittleBaby.com! These burp cloths look terrific in your diaper bag and make it easy to distinguish between your beautiful burp cloth and theirs. Made out of really soft cotton, they're a real nice size, 14 1/2" x 18 1/2"! Sold in bundles of 3, these are a perfect gift for a friend or for yourself... and believe us when we tell you that you will have burp cloths much longer than you want... so shouldn't they be beautiful?? 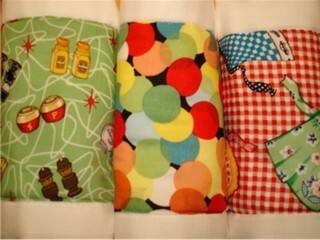 Check out all of the wonderful choices at www.BeeMyLittleBaby.com!